Not to be confused with Japanese MotoGP rider Shinya Nakano. 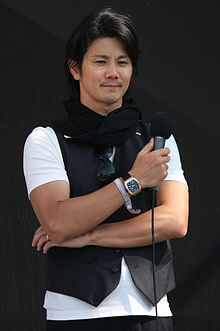 Shinji Nakano (中野 信治, born 1 April 1971) is a Japanese professional racing driver. His father, Tsuneharu, was also a racing driver. He competed in the All-Japan Formula Three Championship. 1984-'88: Karting, several Japanese titles. Nakano in the 1998 Spanish Grand Prix, driving a Minardi. Nakano made his debut at the 1997 Australian Grand Prix in Melbourne for the Prost Grand Prix team, owned by legendary four times Formula One World Champion Alain Prost. The 1997 season saw him score two world championship points with a pair of sixth places. With his place at Prost heavily reliant on their engine partners Mugen-Honda, Nakano was dropped in favour of Jarno Trulli, with the second cockpit taken by Olivier Panis, when Prost switched to Peugeot engines. He subsequently joined Minardi for the 1998 season. Nakano struggled in the under-powered, under-financed Italian team. He failed to score any points in 1998 and bowed out of Formula One racing for good at his home Grand Prix at Suzuka, Japan, having contested a total of 33 Grands Prix. He spent 1999 as an occasional test driver for the Jordan team, which also used Mugen-Honda engines. After Formula One, Nakano went to race in Champ Car for Walker Racing and Fernandez Racing. He made 56 starts from 2000 to 2002 with a best points finish of 17th in 2002 and a best race result of 4th at the 2002 Molson Indy Toronto. He also started 15th in the 2003 Indianapolis 500 for Beck Motorsports, finishing 14th. He competed in the 2006 and 2008 24 Hours of Le Mans races and returned to the event in 2011 with OAK Racing and 2012 with the Boutsen Ginon squad. Nakano's helmet was black with a black circle on the top surrounded by a white halo, with a red and silver flame design surrounding the visor and a black and silver checkered flag behind of it, in CART he changed the black for white, the halo became blue, the black circle became red, the checkered flag disappeared and the flame became red with blue outline. in LeMans, he added more flames in the point where the checkered flag was. † Driver did not finish the Grand Prix, but was classified as they had completed over 90% of the race distance. ^ Jenkins, Richard. "The World Championship drivers — Where are they now?". OldRacingCars.com. Retrieved 2007-07-29. ^ Guilmeau, Mickael. "Que sont-ils devenus ? Shinji Nakano". France Racing (in French). Retrieved 2018-12-17. ^ "Shinji Nakano". crash.net. Archived from the original on 2008-04-30. Retrieved 2008-06-05. Wikimedia Commons has media related to Shinji Nakano. This page was last edited on 17 December 2018, at 17:39 (UTC).